The two lines of black characters on the right and two lines on the left are excerpts from the Dao De Jing, Ch. 31, written around 2,500 years ago by the Chinese sage Laozi. Fine weapons of war foretell evil, even things seem to hate them. Therefore a man of Tao does not set his heart upon them. Peace and tranquility are best. To rejoice over a victory is to rejoice over the slaughter of men. Because many people have been killed, it is only right that all survivors should mourn for them. Hence, even a victory should be treated as a funeral. 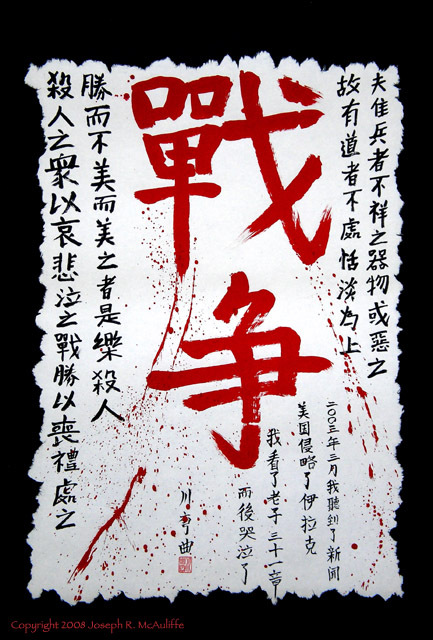 The calligraphy is executed in a hasty, crude form that reflects the destruction, harshness, and lack of beauty that accompany war. “March 2003, I heard the news that the United States invaded Iraq. The row of three small characters left of center is my artist’s name (Chuan Wanqu), which means “River Winding.” That my signature did not escape the uncontrolled crimson splatter is a poignant reminder of how war, especially one that is contrived and unjustified, injures and diminishes us all.